First Class Upgrade: Black Garlic-Sesame Popcorn | Good. Food. Stories. The week between Christmas and New Year’s is a study in contrast between frenzied activity and total sloth. We’ll have some lazy couch-lounging nights ahead of us, but we’re planning a few nights of cocktails and dinner parties with friends, and a meeting with Roger Sterling himself (ok, we’re seeing John Slattery on Broadway). And then there’s New Year’s Eve, for which our plans are up in the air for the first time since 2003. Whether we’re ready to host a party or are feeling too pooped to be socially presentable, popcorn is always the acceptable answer. My love for popcorn is LEGENDARY, but for the holidays, I’m going to make it a little more luxurious. Instead of seasoning my kernels with the usual Parmesan or pizza seasoning, I’m going with the first-class upgrade: black garlic-sesame popcorn. This recipe was inspired by a bar snack at >Cowan’s Public, one of our local hangs that endeared me instantly by having a rotating flavored popcorn on its menu. Sometimes it’s BBQ, sometimes it’s basil aioli with magic dust, and sometimes it’s black garlic and sesame oil. 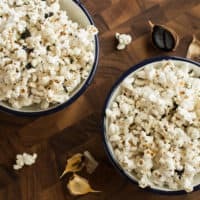 Making a homemade version of this premium popcorn requires a few ingredients that you might have to order online or seek out at specialty grocery stores. The most crucial, obviously, is the black garlic. No, the garlic’s not rotting—it’s very very very slowly cooked for more than a month (some refer to it as fermentation), and that’s why the cloves are that inky black color. With that dense, dark hue comes sweetly caramelized flavor; you can’t get this same taste from regular oven-roasting, so it’s not something I’m going to try DIYing. I’ll just buy mine from Amazon or Trader Joe’s. 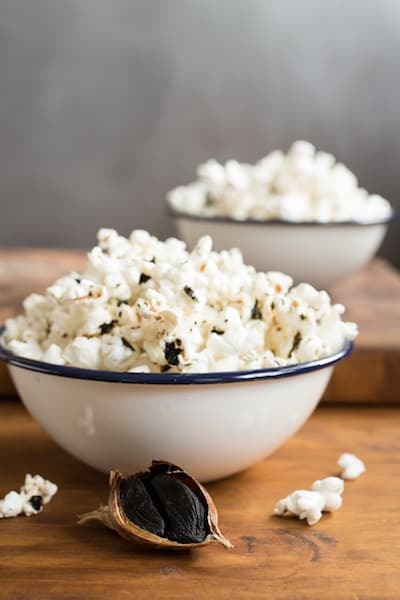 The black garlic and sesame oil do the heavy, but you can turn this popcorn into something exceedingly complex and intriguing with just a touch of extra seasoning. My homemade togarashi salt combines a whole bunch of flavors—briny seaweed, heat from both chiles and peppercorns, bright citrus, and nutty sesame—in a single sprinkle. Even I don’t have this on hand at all times, though, so I’ll raid the pantry for sesame seeds, shichimi togarashi (the inspiration for the seasoned salt blend), and roasted nori snacks to crumble over the popcorn. Make the black garlic butter and let it hang out in your refrigerator if you don’t want to make the popcorn right away. It’s also ridiculously good as a finishing sauce for firm fish fillets like halibut or cod, for scallops or crab, or for roasted vegetables. You’ll get more than you need for a single batch of popcorn, so why not gild the lily for everything? Or, you know, you can just make another bowl of popcorn for dinner. Three guesses as to which one I’ll probably be doing the day after Christmas. 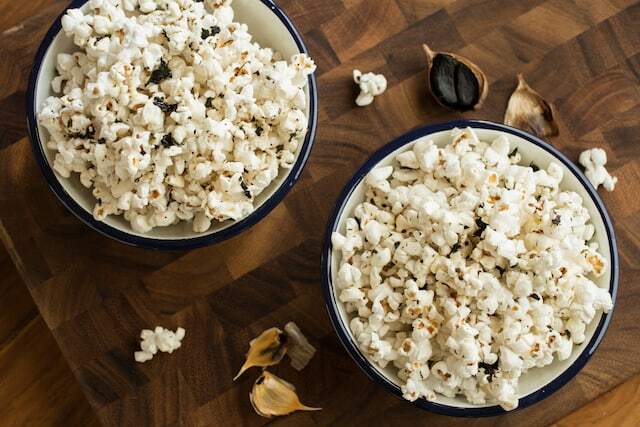 Black garlic-sesame popcorn gets its complex flavor from intensely caramelized garlic and nutty sesame oil. Add roasted nori and sesame for extra depth. Peel the black garlic cloves and chop into roughly 1/2-inch pieces. Add the garlic to the melted butter, and add enough oil to cover the garlic. You may not need the entire 1/2 cup. Cover the dish with a lid or foil and bake for 30 minutes. Remove from the oven and cool until the butter starts to solidify. Scrape the butter into a lidded container such as a Mason jar and refrigerate until it's popcorn time. 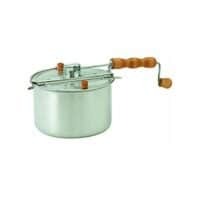 Add the oil and 2 kernels of popcorn to a large (5-6 quart) saucepan or a Whirley Pop. Cover and heat over medium-high heat until the kernels pop, then pour in the remaining popcorn. Cook, stirring or shaking frequently, until the popping sounds slow down dramatically. Remove from the heat. Melt the butter in a small saucepan over medium-low heat, then stir in the sesame oil. Pour the butter over the popcorn and stir to coat. Toss with togarashi salt or kosher salt and your choice of toppings.